Hiking is the perfect opportunity to teach your little one about respecting nature. 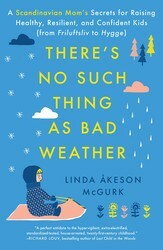 Linda Åkeson McGurk, author of There’s No Such Thing As Bad Weather, shares important tips for staying safe and ensuring a good time. 1. Don’t be in a hurry. If you expect to power walk your way around the trail and make it back within a set time frame, your hike will surely turn into a miserable debacle. With a toddler, it may take you three hours to walk a mile, or it may take half an hour. But probably three, so be prepared. 2. Start small. If your child doesn’t seem into the outdoorsy thing and you’re not into carrying him around anymore, try shorter hikes more often instead of one really long one. That way, you have a greater chance of success, and in case of a meltdown, you’re at least closer to the trailhead. 3. Dress for the weather. Clothing can make or break an outing. If your child has a different idea of what she should be wearing (and typically, it will be considerably less than what you think is appropriate), don’t fight it unless temperatures are dangerously low. Instead, bring extra clothes in a backpack so that you’re prepared when your child starts to complain about having cold hands. 4. Let your child be a leader. Kids and dogs love to be ahead of the pack, so let them. Leading gives kids a sense of responsibility and will make them grow with the task; older children often enjoy reading maps too. If you have more than one child, have them take turns to avoid sibling power struggles. 5. Find interesting things along the trail. Where you may enjoy the view and the accomplishment of making it to the next mile marker, chances are your child is more interested in looking at an ant colony or playing with the pretty leaves on the ground. Pay attention to what piques your child’s curiosity along the trail, and encourage it whenever you can. 6. Choose kid-friendly trails. Research in advance to find trails that have a lot of varying terrain that encourages adventure and imaginative play. Rock formations, ladders, fallen logs, bridges, and bodies of water are usually big hits with kids. 7. Bring a picnic (and emergency snacks). Food and the outdoors are like two peas in a pod. Stopping to eat breaks up the hike and gives everybody a chance to recharge their batteries. Reserve a special treat like hot chocolate to make hiking a special occasion in your child’s mind. And be sure to pack some emergency snacks—if you occasionally have to resort to bribery to get back to the trailhead, nobody will judge you. 8. Bring your furry friends. If you have dogs, this is the time for them to make themselves useful. A game of fetch or hide-and- seek with the dogs along the trail breaks up the walking for the kids, and the dogs love it too. 9. Find your crew. 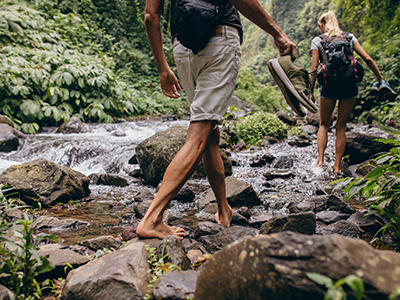 Hiking is much more fun—for kids and adults alike—when done with others. Groups like Hike It Baby get together to hike on a regular basis and have local chapters in many parts of the US. If there isn’t a group in your area, why not start one? Now that your little one has developed a passion for hiking, let him/her join you while you meditate.